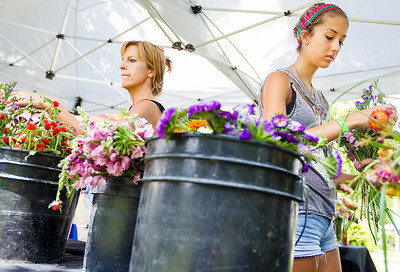 Sarah Nader- snader@shawmedia.com Niki Aggarwal (left) of McHenry and her step-daughter Riley Aggarwal, 17, make their own flower bouquets while shopping at the Woodstock Farmer's Market Tuesday, July 28, 2015. The Summer Market features 23 vendors an is located on the Woodstock Square Tuesday's and Saturday's from 8 a.m. - 1 p.m. May through October. Niki Aggarwal (left) of McHenry and her step-daughter Riley Aggarwal, 17, make their own flower bouquets while shopping at the Woodstock Farmer's Market Tuesday, July 28, 2015. The Summer Market features 23 vendors an is located on the Woodstock Square Tuesday's and Saturday's from 8 a.m. - 1 p.m. May through October.